Industrial Heritage at Corris Mine Explorers01654 761244work Industrial HeritageIt's as if the mine has just closed. Machinery, tools, even the candles and discarded cigarette packets are still in place as the miners left them. Corris Mine Explorers gives you the opportunity to visit these abandoned slate mine workings, to step into the tough working lives of the miners of past generations. During the trip explorers are taken into the dark, damp tunnels and underground workings, in small exclusive groups, by the experienced guide. There are 2 trips to choose from; the 2 hour Explorer Trip or a Half Day Mine Expedition. In addition we offer a Taster Trip for those who want to try it out first and for younger explorers. Suitable for Families (minimum age 8) and anyone wanting a shorter exploration. Kit provided: Hand torch and helmet. Explore the dark abandoned slate workings and find immense chambers and discarded machinery and tools. Get a taste of what the main exploration trips involve. Explore deeper in the mine and learn more of the mine's social history (minimum age 10). Kit provided: Helmet, cap lamp, lamp belt and safety clips. Get kitted up in special safety equipment before exploring the huge abandoned slate chambers. Using safety clips and ropes you will explore your way around the mine, with some scrambling and climbing too (these parts of the trip are optional). Find discarded tools, machinery and other mining relics. See how the machinery would have worked. Be thrillied as stories of life in the mine are brought alive by your guide. A journey of exploration, discovery and exhilarating enjoyment... (minimum age 13). Get kitted up in special safety equipment before exploring different parts of the mine; chambers dug by hand and those which were mechanically excavated. Discover old equipment, see how it would have been used and have a go at working it yourself. You will use your safety equipment, ropes and ladders to move around the old mine workings (these parts of the trip are optional). Find old tools, candles and other mining relics left behind. Feel the mine come alive as stories of its bustling, and often tragic, history spill out in the most fascinating way. You will experience over 10 chambers which are very rarely visited. Walking distance: 2 mile plus. 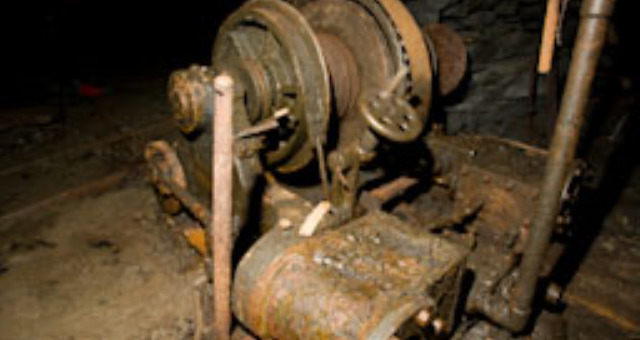 An abandoned winch in the old Braich Goch slate mine, Mid Wales. It's as if the mine has just closed. Machinery, tools, even the candles and discarded cigarette packets are still in place as the miners left them. Please note that there are toilet facilities above ground at the Corris Craft Centre, from where your trip starts. However, there are no toilet facilities underground. Open all year, pre-booking essential. However if you're passing it's worth calling by to see if a trip is running. Note: Minimum age for Taster Trip is 8 years, for the Mine Explorer Trip 10 years & for the Half Day Exploration 13 years. Up to the age of 18, all children must be accompanied by a responsible adult. Located at the Corris Craft Centre on the main A487 road between Machynlleth and Dolgellau.